If you enjoyed this past 2009-2010 Los Angeles Kings hockey season, then be sure to check out this final tribute made by South American fans LA Kings Brasil. Here is this weeks "Card of the Week." 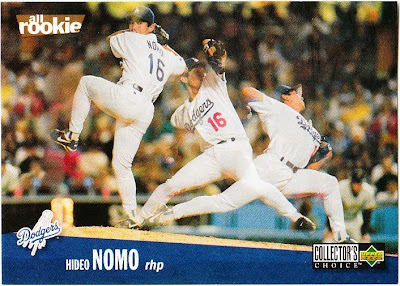 It is a 1995 Upper Deck Collectors Choice #180 rookie card of Hideo Nomo. This is a great view of Nomo's wind-up to his follow-through. A short film from Renaud Hallée, titled Gravité.